As the school year is getting to its end, I've been thinking about how my teaching has changed over the past year or years. Not much, I regret to say! I preach 21st century teaching and learning, but when it comes to applying it in the classroom, it just doesn't seem to work in the way I want it to work. Maybe I'm too harsh on myself, but I feel that there's a missing link between the theory and (my) practice. 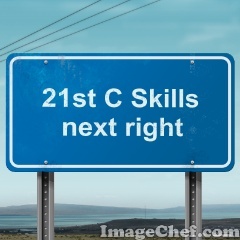 So much has been written about the 21th C skills and as usual, I feel kind of lost in it. That's why I made a Pinterest board and now I'm pinning all the relevant websites to it so that they're at hand. I'm going to delve more deeply into them over the forthcoming holidays and hopefully be ready to roll in September. Last week I had a wonderful opportunity to attend a Master Teachers Course organized in Prague by Intel Teacher Engage and led by the one and only Ollie Bray. Ollie had 18 of us from Eastern Europe + Spain glued to every word he said and made us do all the activities eagerly and enthusiastically for almost ten hours every day. He's an exceptional presenter, a skilful teacher trainer and a great person. Everything was meticulously organized by the wonderful Ruth Merrett from Intel who made it all run smoothly and who took care of all of us with a smile on her face. It was an absolute honour for me to be there with teachers from different countries, some of them Glogster ambassadors like myself, and to learn together with them and from them.